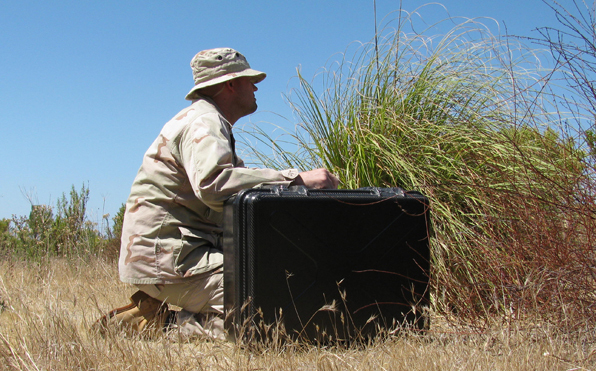 Carbon by Design’s ultra light weight Carbon Fiber and Kevlar Flight and UAV System Cases are designed to allow the war fighter in the field to achieve the lowest possible deployed system weight when combined with today’s ultra-light group 1 UAV’s. 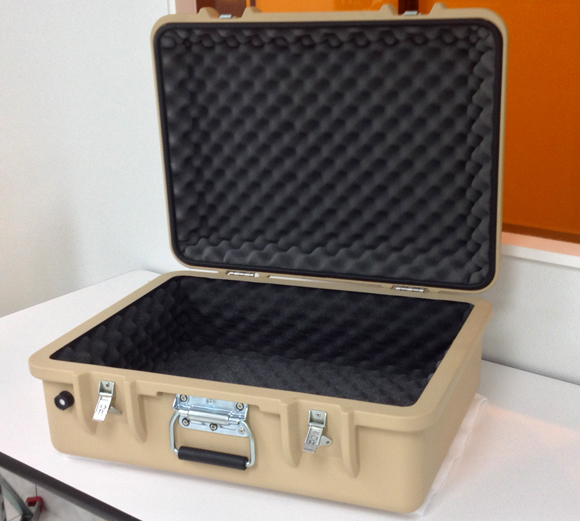 The genesis of this case is a result of our team's experience with operators in the field who are transporting 8 lb. UAV’s in 15 lb. cases. The substantial weight savings between our case and the closest competitor’s offering will allow operators to load more systems onto transport aircraft and limit fatigue in the field when operators must perform substantial on foot excursions to forward operating locations. 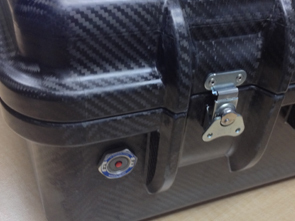 A standard Carbon by Design Case with hardware weighs in at less than 6lbs. compared to the closest competitors resin injected case which weighs 13.5 lbs. Cases are constructed from a combination of Carbon Fiber and Kevlar to achieve the lowest possible density per square inch. 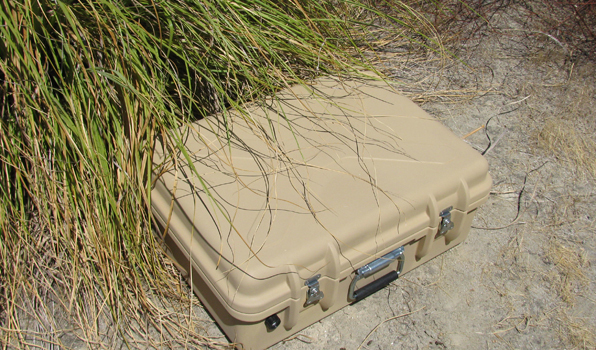 Each case is individually formed using our proprietary high pressure molding technique and cured at a high temperature to allow for field service in temperatures in excess of 250° F.
Standard options for the base configuration include; EPDM water proof seals, MIL-SPEC hinges, pressure relief valve, latches and MIL-Spec spring loaded handles. The gasketing provision includes a unique protective lip which eliminates accidental seal damage while in the field. Hinges and latches are protected by integrated ribs which allow for the case to be positioned on its edge without the possibility of damage to case hardware. Each case has integrated stacking features which allow multiple cases to be stacked vertically for easy storage. 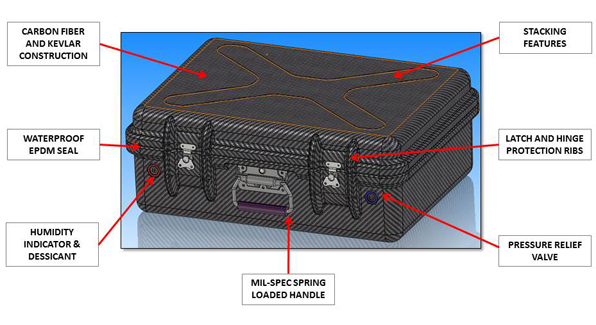 Case interiors are custom configurable for a number of different mission scenarios. Basic interior options include egg crate PU foam, EPP foam, EPE foam and even Supracor® liners. The foam interiors can be custom cut and shaped to customer's individual requirements. Supracor® liners are highly recommended for contents such as larger ISR Gimbals, critical instruments, and any content which is highly valuable. 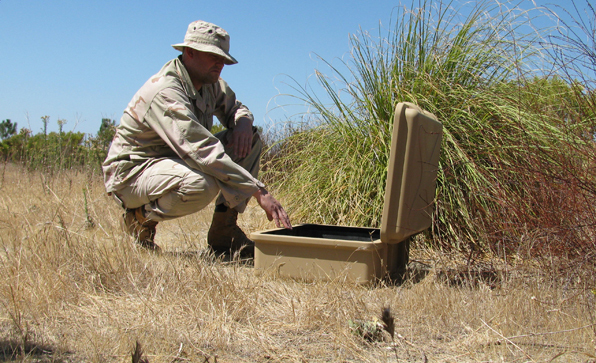 Several unique design features have been integrated into the design of the case specifically to support the electronics requirement of today’s war fighter. Each case includes a channel which runs the perimeter of both the lid and base to allow for cable routing without encroaching on interior volumes. Cases which need to be loaded with sensitive or special equipment are available with a unique nickel and silver plated exterior and conductive wiper seal. Contents in this configuration will see an additional 68db of EMI attenuation at 1GHZ. This special coating is not a paint or a heavy integrated copper mesh, but rather a 2µ plating of nickel and sliver which adds less than 20 grams to the overall case weight. Carbon by Design has the capability to fully integrate power supplies, cables, displays, charging stations, GPS tracking and networking equipment in customer specific configurations. Mission specific testing and qualification services are available for specific, extreme environment requirements. 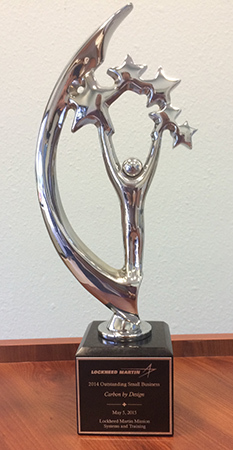 For custom case applications or modifications please contact our engineering team at 760-643-1300 x106 or Contact Form. Cases include integrated, molded features which serve as protection for locking and standard latches. These features protect the latches and hinges from damage during rough handling and when the case is resting on the front or back surfaces. Molded into each case is a set of integral positional stops which allow the lid to remain open at an optimal viewing angle for LCD monitors. The case lid is sized for monitors up to 22", and include additional depth for cooling and air circulation. Additionally, the edge bulkheads can be utilized as conduits for wire runs. All of the hardware supplied on each case is either constructed from stainless steel or directly traceable back to MIL standards. The spring loaded handle specifically meets MIL-810 for gloved hand access. Cases can be further customized with mission specific foam liners and ESD foam for electronic applications. Cases can accommodate 19" and 22" LCD monitors in the lid. Custom cooling options are also available. A custom CBD designed, low profile pull handle with magnetic retention is also available on custom cases. The profile depth of the handle is less than 1" of interior volume. All cases ship with an integrated EPMD seal which is water tight and prevents FOD from entering the case in harsh environments. ESD conductive seals are also available.